University of Montreal campus in the fall foliage. After all these planning meetings, it was time to take action! For months now, the CARP Montreal chapter has been preparing to launch and promote itself on campus. Each team member worked hard towards a successful launching. They made sure no minute detail was left out — flyers, business cards, social media outreach, reservations, etc. 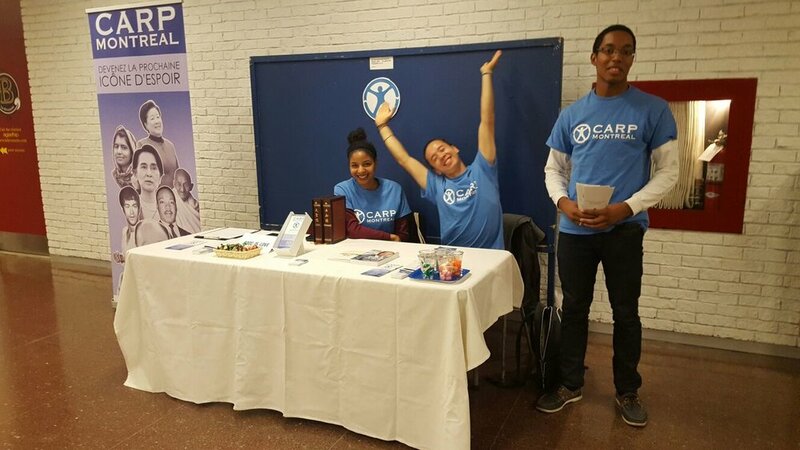 Every time things got challenging, the CARP Montreal team reminded themselves of their mission to empower students and raise them into future leaders through the Unification Principles in order to make the world a better place. Finally, on Friday September 30th, the team set up a stand on campus and promoted their CARP chapter for a good two hours. Enthusiastic CARP Montreal members on campus promoting their CARP chapter. The few students that came up to the stand seemed very interested, but shy as well. One gentleman looked toward the CARP representatives and gently asked, “Hello. Can I take a look at the flyer?” Then a few seconds later, he popped out another question, “Can I take it with me, please?” At least the flyer sparked an interest. Soon after, a girl came up and asked what CARP was all about. Nathan gave her a brief introduction to CARP’s goals and activities and she seemed very impressed. “Oh! That’s really interesting. I’ve been attending this university for the past two years, but I’ve never heard of such a club before!” She enthusiastically signed up to become a member of the club. This was like a practice round. Monday October 3rd was the big show day. It was the perfect day to promote CARP because the campus was buzzing with activity and there were many students. Candy lined the CARP stand, inviting fellow students to take a look. Some people came up to the stand just to grab one of the flyers. They seemed very busy. Others had more time and it allowed for more interesting conversations with the CARP members. Some students took pictures of the banner, feeling inspired and happy. Even some teachers came up to the stand with curiosity and wide smiles across their faces. Everyone that came to check out the stand seemed pleased and inspired by CARP’s activities. The CARP Montreal members enjoyed having all these interesting interactions with students on campus. CARP Montreal is just getting started. Let’s cheer them on!